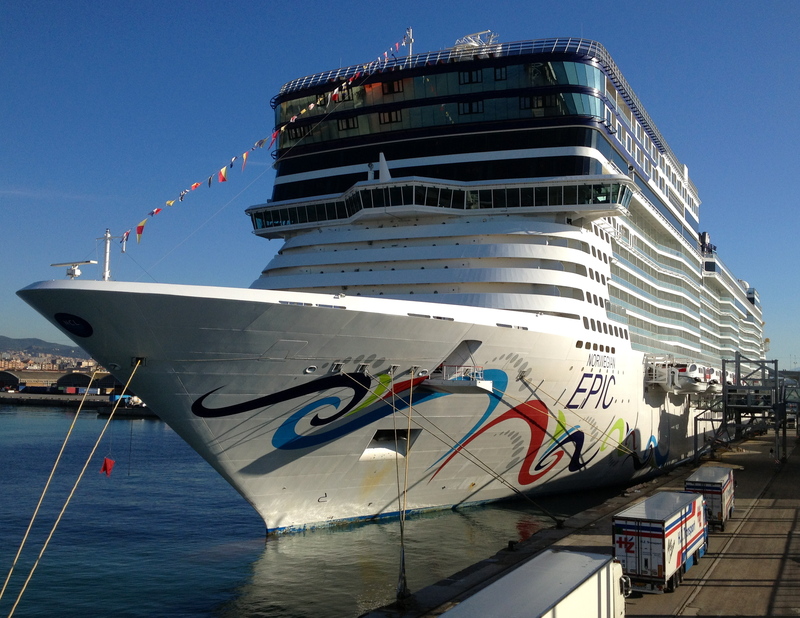 Miami To Barcelona on Norwegian Epic: Worth It? An 11-day TransAtlantic cruise on the world’s third largest cruise ship, at prices starting at just $399 per person, double occupancy, seemed like a bargain that just couldn’t be passed up. So I didn’t. Now, after 11 nights and 12 days on the Norwegian Epic, can I say it was it worth it? I suppose it was. Although it ended up costing three times as much as I originally budgeted for it. Would I go again? With a more compelling itinerary, perhaps. The 4,500-passenger ship sailed about half full. But rather than hope my personal cruise consultant Stacy would help me with an upgrade from an inside cabin, I ponied up a few extra bucks for a balcony. Eleven nights, 12 days inside a windowless box didn’t seem like much of a vacation. What I ultimately paid was still a good value for a ship of that quality, a voyage to Europe and an itinerary of that many days. But I wondered what happened to that “free balcony upgrade” all those ads promised. Though I felt Stacy let me down prior to the cruise, the crew onboard more than made up for any issues I might have had with the booking process. I did receive a further upgrade onboard, and some very nice spiffs. I was impressed with the very professional way the ship was run – particularly by the captain, the hotel director, his assistant, and the restaurant managers. I’ve never cruised with a finer crew! The most surprising thing about the cruise? The food. I thought the food in every one of the restaurants onboard that I tried served the best I’ve ever tasted on a cruise ship. Even on the evening of the final day onboard, I thought the dinner offerings were very tasty. This was a shock to me, as I’m usually very critical of cruise ship cuisine; I’ve been on some cruises where the food was so bad I weighed whether to jump overboard and swim ashore. The ship itself is a real one-off. Literally. It was originally part of an unusual, unprecedented three-ship contract between Norwegian and an unheralded French shipbuilder. The relationship was contentious almost from the start; Epic took longer to build than originally planned, with many design changes and cost overruns; the other two ships in the order were eventually cancelled. During initial sea trials, incredibly, an arsonist (never caught) set a major fire with the intention of scuttling the ship. The culprit even sabotaged the fire extinguishers! Damage, fortunately, was limited to a storage area. Though just slightly smaller than Royal Caribbean’s industry-leading Oasis and Allure, the Epic is 32 percent smaller in terms of gross tonnage. It offers some interesting features such as a full size water park, a “Haven” area of luxury suites, nearly two dozen restaurants, and an unprecedented percentage of balcony rooms (no “oceanview” cabins at all), compared to the relatively small number of inside staterooms. The Epic started duty in mid-2010 in the Caribbean, where it stayed exclusively for more than a year. Then NCL felt the need to start alternating it between the Caribbean and Mediterranean, with an 11-day re-positioning cruise each spring and fall. As re-po cruises go, the Epic offers rock-bottom prices, as mentioned above, but the itineraries are not compelling; there’s only one stop, in Funchal, and that’s only long enough to fuel up, clean the windshield and ask for directions. Many other TransAtlantic re-po cruises offer three or more stops to spice up the offering. Maybe that is why the ship was not fully booked. Cruise ships, in general – not just the Epic, tend to wallow along in heavy seas. In the epic (pun intended) three-day Category 7 storm we encountered, the ship’s engines – six massive diesel-electric generators – groaned, grinded and shuddered; the whole ship felt like it was flexing – cabinets and drawers were flung open, and their contents were thrown out; shelves and racks of dishes spilled in the restaurants; panels, doors and windows rattled so loudly it was difficult to sleep. Even in calm seas after the storm, the engines loped along and vibrated the whole ship unpleasantly, like a car in need of a tune-up. The whole ship seemed to run much rougher coming into Barcelona, than it did when it glided so effortlessly out of the Port of Miami. Bad weather can dampen any cruise, in any ocean; but in the cold Atlantic it seemed especially unpleasant – particularly since the Epic was built for maximizing fun in the sun. There’s not much fun to be had when the ship is fighting 30-foot waves, hurricane-force winds and rain. Thank heavens the food was so good.